This chocolate peanut butter will be your own homemade version of Nutella, if you happen to love it and eat it by spoonfuls. Yumm…, right. Whenever I think of the fact that I actually went and bought a peanut butter jar from the shop only to give it away to a friend as the kiddo did not like it and I myself did not know what to do with it many years ago, I feel like kicking myself, that I wasted the bucks on something that could be made so easily at home with only a handful of ingredients. 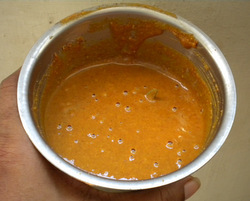 As peanuts are a staple crop at my In-Laws place, it is available throughout the year and this chutney is something that is made at least 3-4 times a week to go with idlis or dosas. 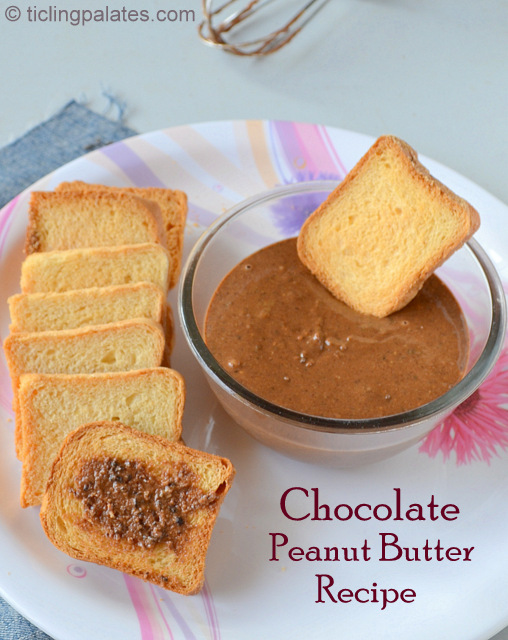 Last year when my younger one’s Doctor advised me to give him lots of nuts to increase his weight, I started to make this butter and the chocolate version too and it was much yummier to eat than just eating plain peanuts by handful. And believe me with some simple and easy changes to his diet plans he did gain weight remarkably. 1. 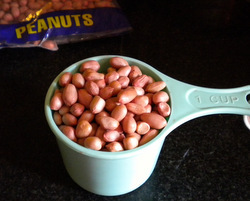 Measure 1 cup of raw shelled peanuts. 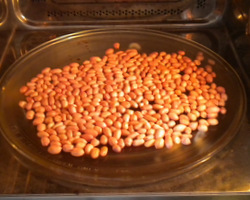 I used my microwave to roast the peanuts as the roasting would be uniform. You can also do the same on stove top. Make sure you do not over do it. 2. Just spread the peanuts on the rotating plate and microwave at high for 1.5 minutes first. Open the door to let the steam out and with the help of a spatula just spread them once again and micro at high for another 1.5 minute. 3. 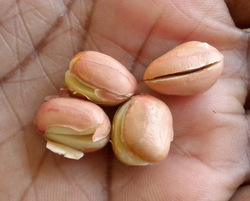 The peanuts skin should not change color and they will crack like shown above. Before grinding if you want you can remove the skin of peanuts by rubbing them with your hands. I prefer the skin and do not mind the dark color of the peanut butter, so always make it with the skin on. 4. 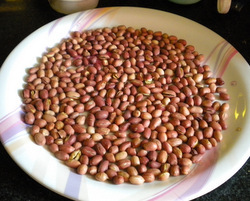 Place the roasted peanuts in a mixer or a food processor, add salt, sugar and pulse at equal intervals till the peanuts become fine to the touch. Now make a hole in the center and add the oil and pulse till the oil emulsifies and combines well with the peanut forming smooth consistency. Transfer to a clean bottle and enjoy the peanut butter with your daily bread. 5. Melt the chocolate chips either in microwave or by double boiler method and pour the warm liquid into a big bowl. To this add 1 cup peanut butter, powdered sugar, vanilla essence, 2 tbsp oil and with the help of a whisk, mix until all are thoroughly combined together. 6. Transfer into clean jars and use it as a spread on breads, toasts, cookies and crackers or as dips for fruit chunks. Just add a colorful ribbon around the neck of the jar and pack it in a colorful paper for a great gifting option. I always make with 1 cup of peanuts to last me a week and I keep the jar on kitchen counter without any problems. If you double the recipe, I suggest you put the jar in the fridge shelf to last more than a week. In case you find any oil on top of the butter, not to worry just mix well before spreading it. 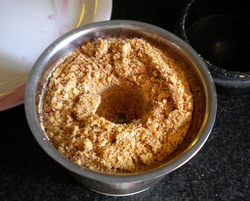 If you want a chunky peanut butter just remove coarsely crushed peanuts while grinding in step-4 and add it at last. Adjust the quantity of sugar as per your preference. My kids love it sweet so I go easy on sugar and reduce the salt to just 2 pinch. While melting the chocolate make sure you do not scorch the chocolate and keep it barely warm. While making chocolate peanut butter instead of extra oil you can use softened butter for a smooth spread, but make sure you store the jar in the fridge to avoid getting spoiled. I used refined peanut oil as it does not clash with the recipe, but feel free to use any vegetable oil. Instead of powdered sugar you can also use icing sugar. If you find the consistency while using powdered sugar a bit thin, no need to worry as it will thicken once again. This is off to “The Groovy Gourmets” and to “The Avant Garde Cookies” and do not forget to check out other cookies Anusha, Jayanthi,Kavi, Priya, Priya Mahadevan, Roshni and Veena as they whip up easy spreads this month. yummmmm!!! !Nice to relish homemade version of the popular PB!! Very interesting version of the royal peanut butter, loved every bit of it. clicks are too inviting. Wow…I just feel like dipping my finger into that yummy peanut butter dear! 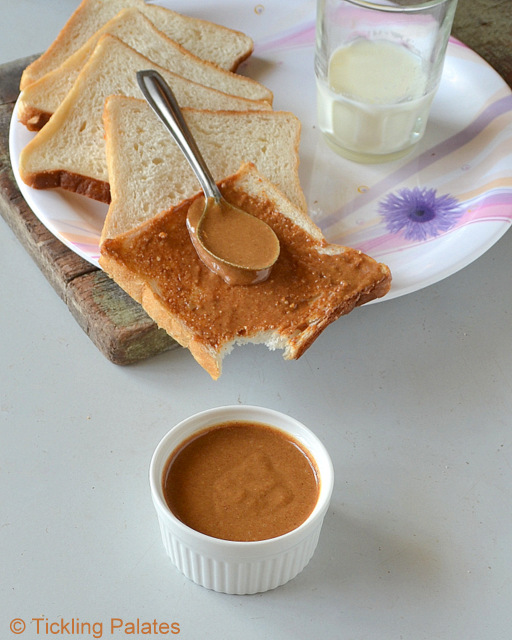 Very tempting and flavourful peanut butter, love to make some soon. 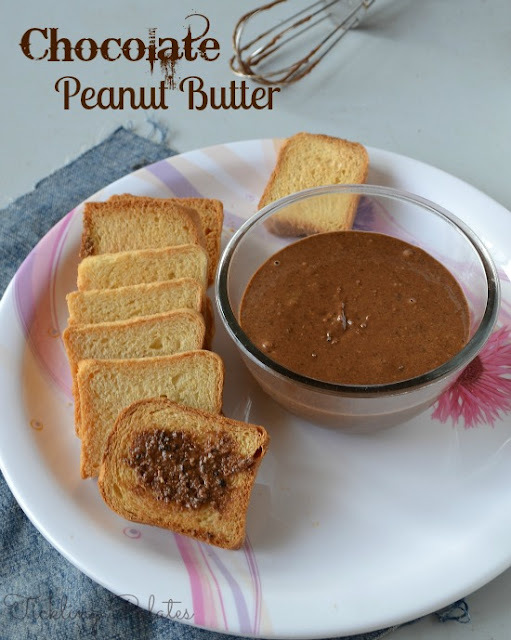 I love the idea of making peanut butter at home..
so delicious and so versatile..
you are going to the Nutella people a run for their money with this recipe Radhi! 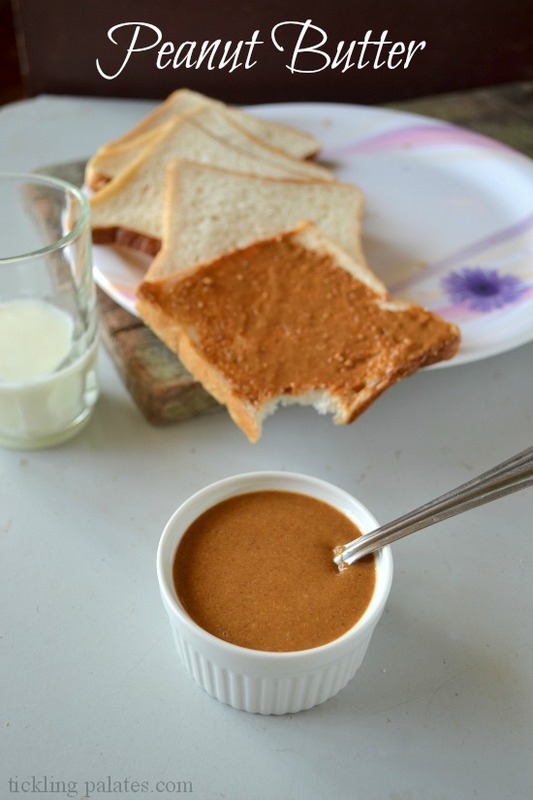 perfect home made peanut butter…. 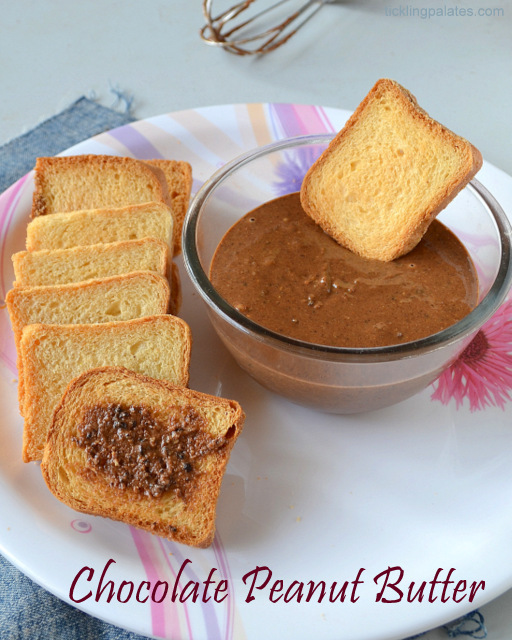 Good one Radhi…like the texture of your PB….and I’m digging any dish with chocolate in it. Looks delish! Which blender do you use? Hi Sneha, I use Preethi mixie.